GUNTERSVILLE, Ala. - Gary Klein, one of the most accomplished and respected bass anglers of all time, has joined Duckett Fishing’s professional staff, the company’s president and CEO, Boyd Duckett, announced today. Klein will compete with Duckett Fishing rods and work with the company on the development of new, specialized rods, including a signature series. “We are honored to welcome Gary Klein to Duckett Fishing. Any company in our business would be extremely excited to bring in a record-setting pro angler. Gary has been to thirty – I’ll repeat that, thirty – Bassmaster Classics. That’s almost unbelievable,” Duckett said. Klein, who lives in Weatherford, Texas, began his pro fishing career in the late 1970’s and is one of the sport’s top 10 all-time money winners. Among his many accomplishments, Klein has earned two B.A.S.S. Angler-of-the-Year titles, eight Bassmaster event championships, two FLW titles and a U.S. Open championship. Klein’s 30 Bassmaster Classic appearances have spanned five consecutive decades. 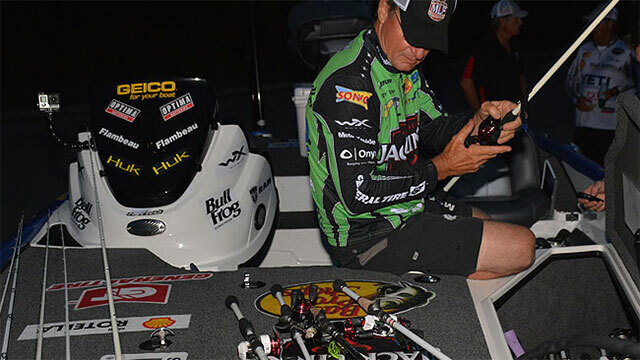 Klein joins several other top-name anglers on Duckett Fishing’s pro staff – a group that includes, among others, Elite Series champion anglers Dean Rojas, Terry Scroggins, Kelly Jordon, Tim Horton and Duckett. “This is a tremendous opportunity to be able to work with a company and a group of people that have a true passion for the sport of fishing. Duckett Fishing has a commitment not only to creating and manufacturing the highest quality products, they stand behind their products and their people,” Klein said. Klein’s addition to the Duckett Fishing team is not the first joint venture that Klein and Duckett have undertaken. They are two of the primary creators of the format now utilized on Outdoor Channel’s Major League Fishing television series. Klein and Duckett were chosen by peers to jointly lead a pro anglers coalition that owns half of the Major League Fishing franchise.